Fans of classic science fiction will be delighted to see Leigh Brackett’s name turning up in mainstream media outlets of late. In the decades following her death, it’s uncommon to hear anything but good about her contributions to Star Wars. The quality and success of The Empire Strikes Back is generally taken as the ultimate vindication of someone that took a lot of flack over the course of her career for her unwavering conviction that space opera was a most excellent style of science fiction. But all of that’s in the process of being erased now. The news stories invoking her are in fact actively diminishing Leigh Brackett’s role in the development of the movie script. These stories all seem to be working from the same sheet of talking points as they all go out of their way to emphasize the fact that Leigh Brackett’s script was discarded. It’s hard to imagine journalists running with this freshly minted narrative not being aware of how jarring the change is here. It’s even harder to understand how they could go forward with this without taking a few minutes to verify that what they’ve been handed is even remotely correct. But it keeps happening at one site after another. It’s now at the point where these people cite each other in order to back up their assertions! It didn’t have to be this way. 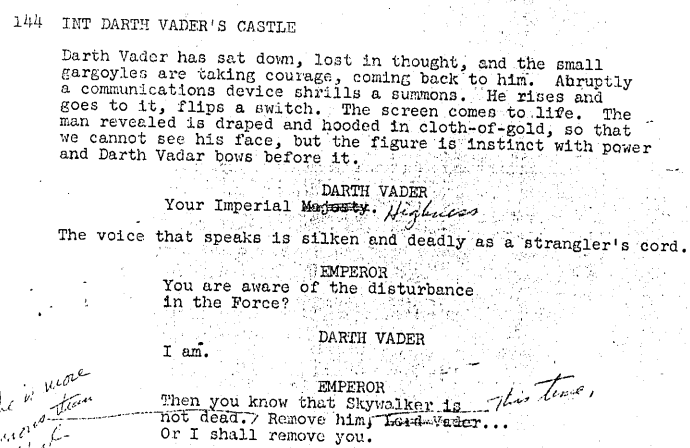 Within minutes of googling up a PDF of the script, you can see that Leigh Brackett’s work is very much recognizable as being a draft of what would become The Empire Strikes Back. As to things that got changed and things that got cut from Leigh Brackett’s script, these are at least as interesting as the things that were maintained throughout the entire collaborative process. But to claim that her script was “discarded” as so many journalists are doing right now, that is flat wrong. They ought to be ashamed of themselves. But as we’ve seen with other news stories that have followed this same pattern in the past year, this is their job. Brackett is usually a great writer. My favorite book of hers that I have is the Ace Double book with “The Secret of Sinharat” and “People of the Talisman.” And I have to watch Hatari! at least every year, a movie scripted by her, that actually is a bit different than her usual fare. Rather than tight and fast, it’s a bit rambly and even kind of cozy; a bunch of guys sitting around, hanging out, acting all macho—and then they go chase exotic animals to capture them for the zoo. It’s pathetic to see her written out to push a narrative. I’m rapidly losing confidence in the Star Wars franchise. This reversion to the social justice convergence is likely to be the death of the brand if they’re not careful. I watched several movies with Leigh Brackett scripts this year and they were just plain awesome. Loved Hatari!, too. It felt like a great Traveller situation. Hey, guys! Considering that the media has spent the last few days rewriting history, denigrating Leigh Brackett’s contribution to Empire Strikes Back, this is a pretty big deal. Jeffro spent the better part of yesterday, Leigh Brackett’s birthday, going through Brackett’s script on G+ busting this recently fabricated media myth about the Queen of Sci-Fi, that her contributions to Star Wars were minimal and “discarded”, and now he’s putting it all together on WordPress. Sure, Brackett’s first draft underwent a number of changes and rewrites before being filmed, but that happens to ALL screenplays. What doesn’t always happen is a screenwriter passing away before they have the chance to do the rewrites themselves. While a reading of Brackett’s Empire script will turn up a lot of differences from the final product, anyone reading it will find there is more than enough there that is so obviously and essentially Empire that it would be readily apparent that any articles claiming that Brackett’s script was “discarded” were not only disingenuous in their marginalization of Brackett but flat out wrong! I liked that existential bit about Lando being a clone. Realizing and appreciating the importance of individuality would’ve been a much better character arc for him than feeling guilty about double-crossing a double-crosser. 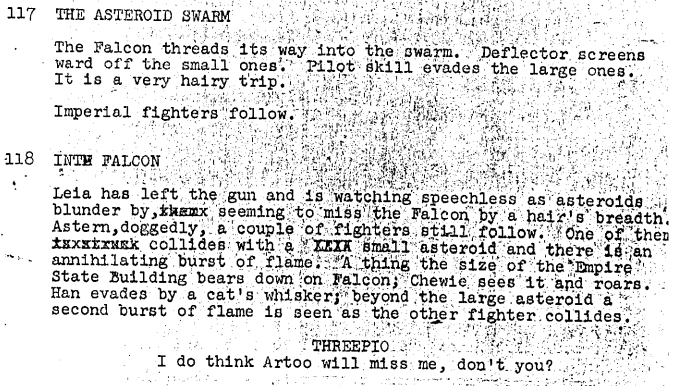 I wouldn’t be surprised if stuff “discarded” from Leigh Brackett’s script ends up getting repurposed in later movies. I think she has a fair stab at what would become the Ewoks, for instance…. I’m loving what I’m seeing, though. And man, Darth Vader with an evil castle filled with pet gargoyles? Kickass! I like the people that ride around on giant manta rays. I had to reread it because I couldn’t believe that was even on the table at some point. Let me see if I’ve got this straight: the way to fight the Patriarchy is to devalue contributions women have made to important media franchises? Welp. That covers lying, projecting; doing this to one of the greats covers doubling down. With so few tricks up their sleeve you can’t play SJW Bingo – they don’t have enough tricks to play SJW tic-tac-toe. They are everything they said about Sad Puppies and Gamergate. Ironically (or not from this crowd) the more talented the woman the worse they will treat her. That said, I would have liked the manta ray riders. There’s actually nothing ironic about that. Accomplishment due to talent and hard work? Anathema! Lack of accomplishment due to “oppression by the patriarchy?” That’s their favorite story. There are now manta-ray riders in the Star Wars Expanded Universe, and I put them there. I made up the “Wind Raiders of Taloraan” for a Star Wars Adventure Journal piece back when West End Games had the Star Wars license. Everything became Property of George Lucas, and apparently someone at one of the video-game projects liked my inhabited gas giant with flying manta rays because Taloraan was developed as a setting for an (abortive, I think) game project. That in turn apparently inspired the Dark Horse comics writers working on the Clone Wars comic a couple of years ago, because I took my son to the comic shop and he picked out a comic about Anakin and his cute young apprentice having adventures on . . . Taloraan. When I was able to demonstrate to my son that I _invented_ that planet, I ascended (briefly, to be sure) to God-Emperor Cool Dad status. All of which means I know exactly where Leigh Brackett got those flying manta-rays, because I’m willing to bet she stole them from Arthur C. Clarke’s “A Meeting With Medusa,” same as I did.